My journey to becoming a parent has always been intertwined with my fight to survive Acute Lymphoblastic Lymphoma – an aggressive blood cancer I was first diagnosed with in May 2011 when I was 25 years old. Back then, I was not planning to have children immediately but I dreamed of becoming a mom one day. I knew chemotherapy could leave me infertile, so I delayed treatment to freeze my eggs and preserve my dream of pregnancy. The first five months of August’s life were monumental to my husband and I but not unlike that of other new parents. Then, on Oct. 16, I was nursing my son at my parent’s home when I got a call from my oncologist and my entire world crashed down. My cancer was back. Initially, I listened carefully and focused on logistics. I calmly handed my baby boy to my mother and began taking notes. After about 5 minutes, the doctor said something about my son and I lost it. My breath caught in my throat and tears began pouring from my eyes. I quickly asked to call him back and hung up the phone. I struggled to contain my emotions as I left the room to tell my parents the news. While I was speaking to them, I was consumed by thoughts of my baby boy. Rose is a passionate advocate for young adults with cancer and caregivers. She is the founder of Thrive Through Cancer, a local organization dedicated to providing resources, a platform to share stories and community. I picked up my little man and hugged him close to my chest, whispering to him how much I loved him, trying not to upset him with my own tears. I handed him back to my mother and felt my body fold. “I don’t want to leave him.” I sobbed. This overwhelming sentiment held several truths: I didn’t want to stop breastfeeding. I didn’t want to spend nights in the hospital away from my family. I didn’t want to widow my husband and leave my beautiful boy motherless. In the past month I have had spinal taps, two surgeries, a bone marrow biopsy, a CT and a PET scan. I started a year of chemotherapy and began planning for a possible stem cell transplant. Motherhood changes everything, and cancer is no exception. Four years ago I was only responsible for caring for myself. Now I am trying to balance chemotherapy-induced nausea and steroid mood swings with feeding schedules and nap times. Sometimes my son is a beautiful distraction who keeps me feeling hopeful and reminds me to cherish every moment I have on this planet. Sometimes I’m praying he will sleep 15 more minutes so I don’t have to get out of bed. I am always questioning whether I can fight cancer and be the kind of mom I’ve always wanted to be. Rose’s essay was one of many submitted for PEPsTalk in 2016. This has easily been the most challenging month of my life, but also one of the most meaningful. I have been blessed to receive incredible support from those around me, especially my fellow PEPS moms. None of the eight moms in my group have battled cancer themselves, and yet, they were some of the first people I shared my diagnosis with and the first to spring into action. 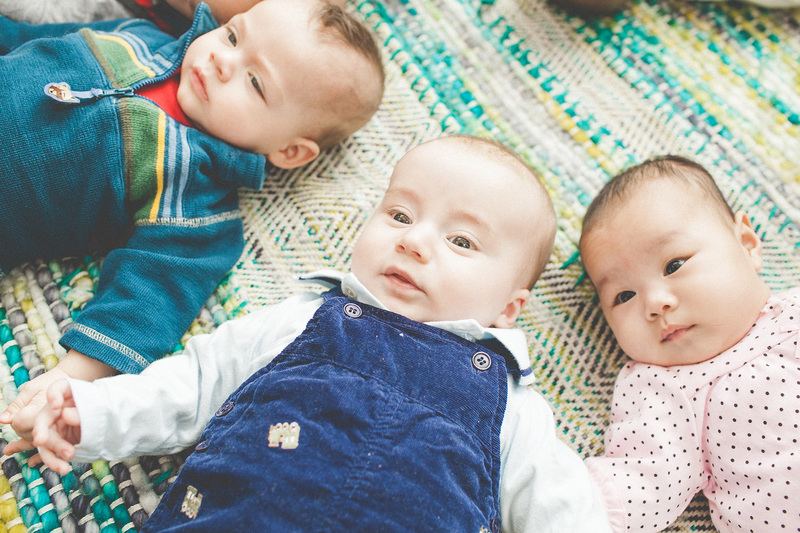 Instead of asking “How can we help?” they simply started helping – setting up a meal train, providing homemade baby food, gathering extra baby gear to create a second nursery at my parents. I am endlessly grateful to PEPS for creating such a strong and loving community. I never imagined that I would be fighting cancer again with an infant, but I am strengthened by the beautiful community that surrounds me and the friends I know will carry our family through this challenging time. Rose Ibarra and husband, Angel are parents to baby August. Rose is a passionate advocate for young adults with cancer and caregivers. She is the founder of Thrive Through Cancer, a local organization dedicated to providing resources, a platform to share stories and community. She is the host a podcast series from Swedish called Voices of Cancer and has shared her story about fertility after cancer. As a cancer survivor and mother of two, I want to thank you for writing this. I was diagnosed two years ago with Diffuse Large B Cell Non Hodgkin’s Lymphoma when my children were 3 and 4 years old. I had no symptoms, but dislocated my knee and on the MRI, a tumor was found in my left femur. Originally dismissed as a benign encondroma, I wasn’t even told it was there until 6 months later when I re injured my knee and went for a second MRI. At that point, it had grown and I was then turned over to the bone cancer specialist. Because it wasn’t bone cancer, he repeatedly told me “it doesn’t look like cancer, act like cancer. I think there is 0% chance it is life or limb threatening.” After watching it for another 6 months and having it grow another 9 mm, a bone marrow biopsy was finally done and 11 days later he had to tell me the news. I had cancer. Since that time, I have met SO MANY women who have cancer or who have had cancer, including my step sister who was diagnosed several months after me with ALL also. Most recently, a very close friend was diagnosed with breast cancer. I have come to learn that there are many of us out there and while we aren’t talked about much, we are here, fighting for our lives while raising young children and wondering if we will be here to see them reach life’s important milestones. While I am blessed to be in remission for the past two years, I still struggle every day with pain and the fall out – physically and emotionally from chemo and the “cancer experience” overall. Seeing the tool it took on my daughter has been particularly painful. Seeing me lose my hair was traumatic for her even at her young age. Thank you again for being a voice for all of us out here living through cancer. Many blessings to you and your family.